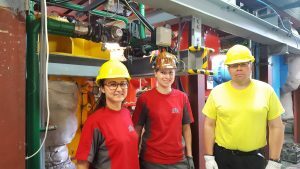 Productive week at IFK gasification facility, where Selina Hafner (University Of Stuttgart) hosted Isabel Martínez (CSIC) and Juha Palonen (Sumitomo SHI FW) to play with her 200 kW gasifier. A lot of biomass ashed… What a fun! FLEDGED project includes the validation of flexible operation of sorption-enhanced gasification in an industrialy relevant environment. Moreover, the experiments of syngas production from biomass give useful results that will help in calibration and validation of gasification models. Learn more about the sorption enhanced gasification process here.